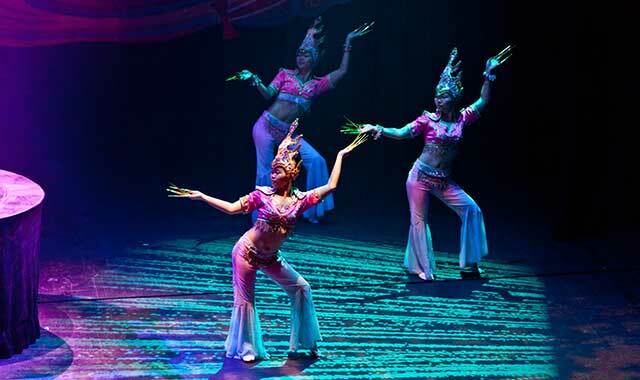 The talented members of Golden Dragon Acrobats deliver a colorful world of Chinese art to Aurora’s Paramount Theatre on March 26. Feb. 15-March 19, Wed.-Sun., check website for times. Steven Sondheim’s tale of a betrayed barber who’s out for revenge. Paramount Theatre, 23 E. Galena Blvd., Aurora, (630) 896-6666, paramountaurora.com. Feb. 17, 8 p.m. As a performer, songwriter and producer, Marx’s career, which spans three decades, has had its share of highlights. He’s the only male artist in history to have his first seven singles reach the Top 5 on the Billboard charts. Raue Center For The Arts, 26 N. Williams St., Crystal Lake, (815) 356-9212, rauecenter.org. Feb. 19, 3 p.m. The Elgin Youth Symphony Orchestra’s acclaimed Maud Powell String Quartet and Earl Clemens Wind Quintet perform classical chamber music. The Elgin Master Chorale Children’s Chorus draws together some of the region’s most talented students. Norris Cultural Arts Center, 1040 Dunham Road, St. Charles, (630) 584-7200, norrisculturalarts.com. Feb. 19, 3 p.m. Andrea Darlas, radio & TV news anchor/reporter at WGN Radio & WGN TV, and Patti Vasquez, host of the Patti Vasquez Show on Chicago’s WGN Radio, talk about women in the fields of broadcasting and comedy. Raue Center, Crystal Lake, (815) 356-9212, rauecenter.org. Feb. 23-26, check website for times. Each February, the best college jazz bands in the country converge on campus for three days of performances and education. Elmhurst College, Hammerschmidt Memorial Chapel, 190 Prospect Ave., Elmhurst, (630) 279-4100, Elmhurst.edu. Feb. 24-March 19, Fri.-Sun. In this Woody Allen farce, an American family accused of spying is trapped in a run-down embassy in a Third World country. Steel Beam Theatre, 111 S. Main St., St. Charles, (630) 587-8521, steelbeamtheatre.com. Feb. 24, 8 p.m. The award-winning guitarist combines electric funk and slide guitar, along with jazzy instrumentals and a soulful feminine voice. Wentz Concert Hall, North Central College, Naperville, (630) 637-7469, finearts.northcentralcollege.edu. Feb. 24, 8 p.m. This Bayou Man, Mr. Mojo, and his musical guests have entertained audiences around the world for more than 25 years. It’s hard to match the unbridled fever this singer/accordionist brings to the stage. Arcada Theatre, 105 E. Main St., St. Charles, (630) 587-8400, arcadalive.com..
Feb. 25, 8 p.m. The Aquila Theatre Company presents the famous story created by Agatha Christie, one of the greatest mystery writers in world literature. This production features a powerful whodunit, with the help of Aquila’s thoughtful, signature style. Fermilab, Ramsey Auditorium, Kirk Road & Pine Street, Batavia, (630) 840-2787, fnal.gov/culture. Feb. 25, 7 p.m. The Crystal Lake Strikers All-Star Drumline leads multiple groups of outstanding musicians from all over the region to present a high-energy night of percussion. Raue Center, Crystal Lake, (815) 356-9212, rauecenter.org. Feb. 26, 3:30 p.m. Join Schaumburg’s multi-faceted student orchestra and guest artists as they demonstrate how symphonic music entertains. Prairie Center for the Arts, 201 Schaumburg Ct., Schaumburg, (847) 895-3600, prairiecenter.org. Feb. 26, 3 p.m. Rita Moreno, one of the very few and very first performers to win an Oscar, an Emmy, a Tony and a Grammy Award, hosts an evening of song and story. She’s appeared in “West Side Story” and “Slums of Beverly Hills.” Arcada Theatre, St. Charles, (630) 587-8400, arcadalive.com. Feb. 26, 2 p.m. Elgin Symphony Orchestra cellist, composer and fused glass artist Betsy Start and her ESO friends show how poetry can spark the imagination. Gail Borden Public Library, 270 N. Grove Ave., Elgin, (847) 742-2411, gailborden.info. Feb. 26, 11 a.m. Join DuPage Symphony Orchestra Music Director & Conductor Maestra Barbara Schubert for a day of brunch and music. DuPage Symphony Orchestra, Chicago Marriott Naperville, 1801 N. Naper Blvd., Naperville, (630) 778-1003, dupagesymphony.org. March 3-19, Fri.-Sat. 8 p.m., Sun. 3 p.m. The hit movie comes to life in this dazzling, energetic and adored musical. Based on the novel by Amanda Brown and the film starring Reese Witherspoon. Woodstock Opera House, 121 Van Buren St., Woodstock, (815) 338-5300, woodstockoperahouse.com. March 3-5, Fri.-Sat. 7:30 p.m., Sun. 2:30 p.m. Russian-born Alexander Fiterstein joins ESO during a performance of composer Aaron Copland’s “Billy the Kid Suite” and clarinet concerto, in addition to Tchaikovsky’s “Symphony No. 4.” Fri. show: Prairie Center, Schaumburg. Sat.-Sun. performances: Hemmens Cultural Center, 45 Symphony Way, Elgin. Tickets: ESO, (847) 888-4000, elginsymphony.org. March 3, 8 p.m. Stephen Pearcy continues to record and tour, much to the delight of a new and emerging fan base of “medalists” and “Ratt & Rollers.” Arcada Theatre, St. Charles, (630) 587-8400, arcadalive.com. March 3, 5 p.m. Meet and mingle with artists whose original work is on display in two galleries; enjoy live music. This month’s featured exhibit: Clothes from the Past. Lakeside Legacy Arts Park at the Dole, 401 Country Club Road, Crystal Lake, (815) 455-8000, lakesideartspark.org. March 4, 8 p.m. This German guitarist became famous as the lead guitarist for the Scorpions. He is also one of the earliest contributors to the neo-classical mental genre. Arcada Theatre, St. Charles, (630) 587-8400, arcadalive.com. March 4, 8 p.m. This tribute band is celebrating 10 years of performing Pink Floyd. With a combined experience of more than 50 years, this all-star cast brings the music and experience of Pink Floyd to audiences during a time when the appreciation of the classic group has never been greater. Raue Center, Crystal Lake, (815) 356-9212, rauecenter.org. March 5, 3 p.m. Broadway veterans Glory Crampton and Franc D’Ambrosio celebrate the music of Andrew Lloyd Webber. Arcada Theatre, St. Charles, (630) 587-8400, arcadalive.com. March 5, 7 p.m. Brian FitzGerald and Martin McCormack, of the duo Switchback, have been playing their brand of electric Celtic and Americana music at sold-out concert halls and festivals for more than 20 years. Their concert features a mix of Irish music and original songs. Raue Center, Crystal Lake, (815) 356-9212, rauecenter.org. March 5, 2:30 p.m. This Chicago-based mixed chamber ensemble is noted for its signature symphonic sound and virtuosity. It presents an eclectic variety of works from Baroque to contemporary, soloist to full chamber ensemble. Fermilab Art Gallery, Batavia, (630) 840-2787, events.fnal.gov. March 9-19, check website for times. This continues to be one of the most widely produced musicals because of its wit, charm and the message of acceptance and progress it portrays. Stage Coach Players, 126 S. 5th St., DeKalb, (815) 758-1940, stagecoachers.com. March 9, 7 p.m. A monthly reading series based around selected themed classic and contemporary literary works. This month: Commemorate the 1916 Easter Rising in Dublin. LePetit Marche, 19 N. Williams St., Crystal Lake, (815) 477-3296, petitmarche.biz. March 10, 7:30 p.m. Watch a team of artists paint right before your eyes. Accompanied by vocals, choreography, live music and audience reaction, people who experience this show are in for a treat. Batavia Fine Arts Centre, 1401 W. Wilson St., Batavia, (630) 937-8930, bataviafineartscentre.org. March 10, 8 p.m. Greg Kihn’s career stretches from the dawn of punk and indie rock to the discos of the ‘80s and all the way to MTV. He helped write the book on revolutionary West Coast rock and roll. With special guest The Dream Police. Arcada Theatre, St. Charles, (630) 587-8400, arcadalive.com. March 11, 7:30 p.m. Chicago actress Alexis J. Ralston portrays legendary jazz singer Ella Fitzgerald and rekindles hits like “Blue Skies.” Prairie Center, Schaumburg, (847) 895-3600, prairiecenter.org. March 11, 8 p.m. This rock ‘n’ roll trio of brothers debuted in 2003 and, with the help of No. 1 hit “Heaven,” the group sold millions of albums, won a Grammy, and racked up critical acclaim. Wentz Concert Hall, North Central College, Naperville, (630) 637-7469, finearts.northcentralcollege.edu. March 11, 8 p.m. Known as one of the best live acts around, this group continues to tour year-round and deliver high-energy performances. Arcada Theatre, St. Charles, (630) 587-8400, arcadalive.com. March 11, 8 p.m. The actor, producer and best-selling author is best known as the lead singer for Canadian folk rock band Great Big Sea. Fermilab, Ramsey Auditorium, Batavia, (630) 840-2787, events.fnal.gov. March 12, 3 p.m. Get ready for St. Patrick’s Day by joining The Ragged Rascals, an Irish Folk band. They travel across the Chicago area performing their own brand of Irish songs and traditional Irish favorites. Norris Center, St. Charles, (630) 584-7200, norrisculturalarts.com. March 12, 5 p.m. With an unmistakable voice that helped define “the sound of young America,” with songs like “Power of Love,” Reeves has become one of music’s most beloved and acclaimed female singers. Arcada Theatre, St. Charles, (630) 587-8400, arcadalive.com. March 17, 8 p.m. Party with one of the most soulful vocal disco groups of the ‘70s. Every show is a party. Arcada Theatre, St. Charles, (630) 587-8400, arcadalive.com. March 17-April 2, Fri.-Sat. 8 p.m., Sun. 3 p.m. A psychological thriller about poetry, madness and identity theft in Victorian England. Williams Street Repertory, Raue Center for the Arts, Crystal Lake, (815) 356-9212, rauecenter.org. March 18, 7:30 p.m. These four musicians and actors were picked by Louise Harrison, sister of the late George Harrison of the Beatles. Together, this quintet resurrects the Beatles experience. Prairie Center, Schaumburg, (847) 895-3600, prairiecenter.org. March 19, 2 p.m. ESO Concertmaster Isabella Lippi plays works by Brahms and Mozart with pianist Bill Koehler. Gail Borden Library, Elgin, (847) 742-2411, gailborden.info. March 18-19, Sat. 8 p.m., Sun. 3 p.m. The Donald Sinta Saxophone Quartet graces the stage for William Bolcom’s jazzy Concerto Grosso, then joins the DSO to celebrate the work of George Gershwin, with “An American in Paris” and “Rhapsody in Blue,” featuring pianist Fei-Fei Dong. DuPage Symphony Orchestra, Wentz Concert Hall, North Central College, Naperville, (630) 778-1003, dupagesymphony.org. March 21-22, 7:30 p.m. Concertgoers who attend this show will experience a bad-to-the-bone icon at his very best. Arcada Theatre, St. Charles, (630) 587-8400, arcadalive.com. March 23, 8 p.m. This pop-meets-country quintet’s a capella shows won them NBC’s The Sing-Off crown and a loyal fan following. Paramount, Aurora, (630) 896-6666, paramountaurora.com. March 23, 7:30 p.m. Chicago Theatre standout Evan Tyrone Martin, warmly resonates the vocal style of musical legend Nat King Cole. Metropolis, Arlington Heights, (847) 577-2121, metropolisarts.com. March 24, 8 p.m. Puddle of Mudd has gained status as bona-fide hit makers. Saving Abel was formed in 2004 and features a southern rock sound. Tantric has defined themselves through six studio albums as a groove-laden, guitar-rich rock band with dense vocal harmonies and melodies. Arcada Theatre, St. Charles, (630) 587-8400, arcadalive.com. March 24, 7:30 p.m. In this visual and musical tribute to Fleetwood Mac, each veteran player brings their passion and spirit to re-create the look and feel of the classic rock group. Metropolis, Arlington Heights, (847) 577- 2121, metropolisarts.com. March 24, 6 p.m. This monthly art exhibit is an open-themed, juried fine art show that covers all mediums. The featured artist is China Cat Tang, who mainly works with linoleum blocks, acrylics, colored pencils and watercolors. The Starline Factory, Harvard, (815) 943-4805, starlinefactory.com. March 25, 8 p.m. Grammy-winning singer-songwriter Rickie Lee Jones’ hip, poetic style, both on and off the stage, has turned her into a cultural icon. Discovered in a New York night club, Peyroux is known for melding jazz, blues and pop into songs that leave listeners in complete awe. Paramount, Aurora, (630) 896-6666, paramountaurora.com. March 25, 7:30 p.m. This moving and emotional concert performance celebrate the music of Carole King and James Taylor. Two longtime friends and collaborators, Kirsti Manna and national recording artist Jonathan Birchfield, capture the essence of friendship through music. Prairie Center, Schaumburg, (847) 895-3600, prairiecenter.org. March 25, 7:30 p.m. This groovin’ group keeps listeners enthralled and dancers in motion with a mix of contemporary blues, swamp pop and traditional Cajun and zydeco music. Metropolis, Arlington Heights, (847) 577-2121, metropolisarts.com. March 25-26, Sat. 8 p.m., Sun. 7 p.m. Rock legends UFO are back on the road, this time with special guests Saxton. Arcada Theatre, St. Charles, (630) 587-8400, arcadalive.com. March 26, 3 p.m. Immerse the whole family in this colorful, intense and theatrical world of Chinese acrobatics. It’s a great opportunity to introduce kids to a rich, 2,500 year-old culture. Paramount, Aurora, (630) 896-6666, paramountaurora.com. March 26, 6 p.m. This country artist has nine No. 1 singles under her belt, 16 Top-40 singles, two Grammy nominations and more than 5 million records sold. She debuted in 1996 with “Heads Carolina, Tales California.” Wentz Concert Hall, North Central College, Naperville, (630) 637-7469, finearts.northcentralcollege.edu. March 31, 8 p.m. This 90-minute, in-depth exploration of Brahms’ “Symphony No. 4” uses visuals and musical excerpts to explain the history and form of the piece. After intermission, the ESO performs the piece. Hemmens, Elgin, (847) 931-5900, hemmens.org. March 31, 8 p.m. One of the “Big Four” Thrash Metal bands comes to The Arcada for the first time. Arcada Theatre, St. Charles, (630) 587-8400, arcadalive.com. March 31-April 15, Fri.-Sat. 8 p.m., Sun. 3 p.m. Based on the 1980 hit movie and set in the late 1970s, this story of friendship and revenge in the Rolodex era is outrageous, thought-provoking and even a little romantic. Woodstock Musical Theatre Company, Woodstock Opera House, (815) 338-5300, woodstockoperahouse.com. April 1, 8 p.m. This quartet from Ukraine reflects fundamental elements of sound and soul, and creates a world of unexpected new music. Fermilab, Ramsey Auditorium, Batavia, (630) 840-2787, events.fnal.gov. April 1-2, Sat. 7:30 p.m., Sun. 2:30 p.m. Pianist Natasha Paremski performs Rachmaninoff’s “Piano Concerto No. 3.” The ESO also performs Brahms’ final work, “Symphony No. 4.” Hemmens, Elgin, (847) 931-5900, hemmens.org. Tickets: ESO, (847) 888-4000, elginsymphony.org. April 2, 5 p.m. For three decades, this American funk/soul band has remained a force in the music industry, with hits including “Brick House,” “Easy,” and “Sail On.” Arcada Theatre, St. Charles, (630) 587-8400, arcadalive.com. April 2, 3 p.m. Chicago’s own Sam Fazio pays tribute to Frank Sinatra. Listen to songs and stories from his time at Capitol Records and his nights in Las Vegas. Metropolis, Arlington Heights, (847) 577-2121, metropolisarts.com. April 7, 5 p.m. Meet and mingle with artists whose original work is on display in two galleries; enjoy live music or performance art, as well. This month’s featured artist: Johana Moscoso. Lakeside Legacy Arts Park at the Dole, Crystal Lake, (815) 455-8000, lakesideartspark.org. April 7, 8 p.m. Livingston Taylor, Tom Chapin and EVA present a night of folk and contemporary music. Arcada Theatre, St. Charles, (630) 587-8400, arcadalive.com. April 7, 8 p.m. Ever since she came on the scene as a teenager by bringing contemporary Christian music to the forefront of American culture, Amy Grant has had a reputation for creating potent songs like “I Will Remember You” and “House of Love.” Raue Center, Crystal Lake, (815) 356-9212, rauecenter.org. April 7, 7:30 p.m. Featuring music from The Great White Way, as well as the pop and film worlds. An Emmy winner and Tony nominee, Callaway has starred in “Miss Saigon,” “Cats” and “Baby” on Broadway. She was also the singing voice of Anya in the Oscar-nominated film “Anastasia.” Metropolis, Arlington Heights, (847) 577-2121, metropolisarts.com. This entry was posted on Wednesday, February 15th, 2017 at 11:57 am	and is filed under Arts & Entertainment. You can follow any responses to this entry through the RSS 2.0 feed. Both comments and pings are currently closed.